Door-to-door warnings, sirens, texts roused many Vancouver Island residents at risk but not all. When the emergency alert came early Tuesday morning, through a mishmash of text alerts, sirens, phone calls from faraway relatives or a knock on the door, West Coast residents' responses ranged from rolling over in bed to heading for a nearby peak. For residents and designated emergency responders, the warning of an approaching tsunami — later cancelled — was a sobering reality check about our state of readiness for an event that will give hours or, in some cases, minutes to scramble to safety. At the top of Victoria's Mount Tolmie (elevation 120 metres) shortly after the first tsunami alert at 2:41, CBC associate producer Nicole Crescenzi found a full parking lot and a crowd of hundreds peering into the darkness towards the Strait of Juan de Fuca. One young man was busy calling his mother to let him know he was safe. One woman had called friends to alert them, and worried about the ones that didn't answer. Another brought her grab-and-go earthquake kit. One woman brought the medical supplies she needed for regular dialysis treatment. "I unplugged my phone and rolled over and went back to sleep," Devlin told On the Island host Gregor Craigie. She only learned of the tsunami alert when she woke at 4:30, after the alert was cancelled. 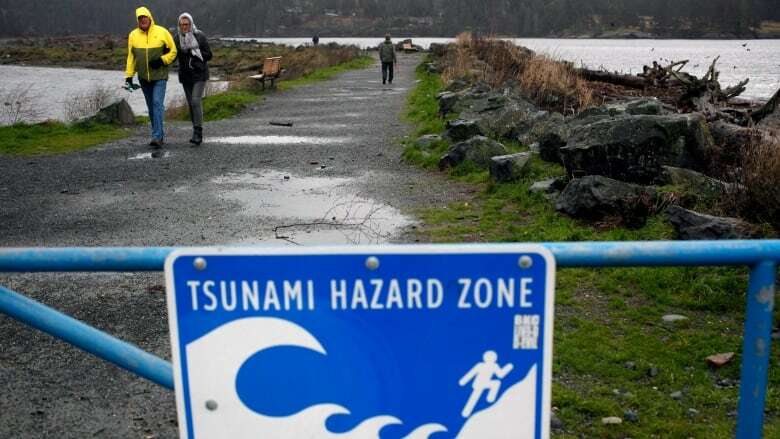 Many Vancouver Island residents first learned from friends and relatives as far away as Antigua and England that a 7.9-magnitude earthquake in the Gulf of Alaska had triggered a tsunami alert for the west coast of British Columbia. Meanwhile, many of the Victoria residents in coastal neighbourhoods who had signed up for Vic-Alert weren't alerted, because they had silenced or turned off their phones. Tanya Patterson, the City of Victoria's emergency program coordinator, said the Vic-Alert system is one area for improvement in the city's emergency response. The tsunami alerts were specifically targeted to subscribers in neighbourhoods with coastal exposure. But the 6,400 subscribers can't program their phones to ring through with a Vic-Alert text or voice message if their phone's turned off, because they are sent out from multiple phone numbers. Patterson said Canadian telecom regulations prohibit push alerts like the ones used in Hawaii where every cellphone in an at-risk area receives alerts for a potential tsunami — or incoming missiles. She said discussions are underway to try to change that. The experience was particularly rattling for those living near sea level, such as James Bay houseboat dweller Margo Goodhand who was notified by a neighbour's knock on the door at 3:30 a.m.
Irene Lockwood, whose waterfront View Royal home is also near sea level, criticized the lack of a warning siren in the Victoria suburb. Fearing a stranger, she hesitated to answer a knock on the door around 4:30 Tuesday morning, which turned out to be a firefighter. By the time she followed instructions to gather her pet and leave, the warning was cancelled. A few kilometres further west along the waterfront in Metchosin, Pearson College principal Désirée McGraw said students and staff passed the test with flying colours. By 3:50 a.m. the 180 students in residence had all been awakened and efficiently marshalled to higher ground.